A distributed library as booklovers paradise. In 2010 Hoog+Diep and DOK embarked on an ambitious project to create a booklovers paradise by allowing them to share their love of reading and their book collection with eachother. The goal was simple; create a place on the web where people love to show off their personal paper collection and lend eachother books. 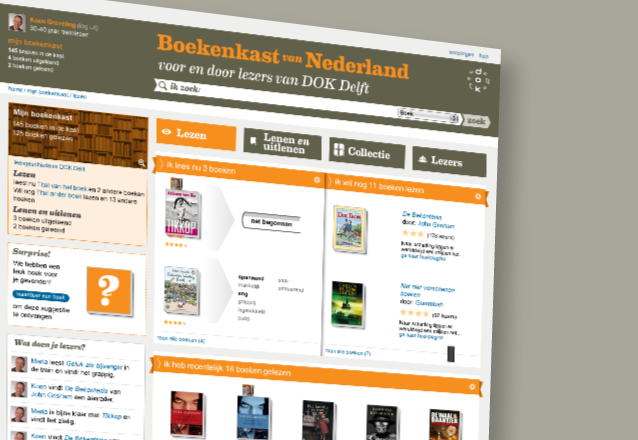 ‘De boekenkast van Nederland’ (the bookcase of the Netherlands) was launched as a pilot at DOK Delft in summer 2011.
boekenkast homepage film from Hoog+Diep on Vimeo.